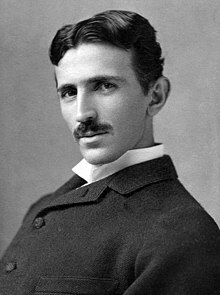 Nikola Tesla (/ˈtɛslə/; Serbo-Croatian: ; Serbian Cyrillic: Никола Тесла; 10 July 1856 – 7 January 1943) was a Serbian-American inventor, electrical engineer, mechanical engineer, and futurist who is best known for his contributions to the design of the modern alternating current (AC) electricity supply system. 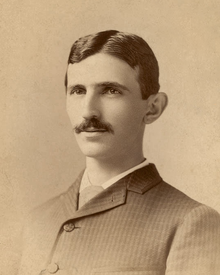 Born and raised in the Austrian Empire, Tesla received an advanced education in engineering and physics in the 1870s and gained practical experience in the early 1880s working in telephony and at Continental Edison in the new electric power industry. 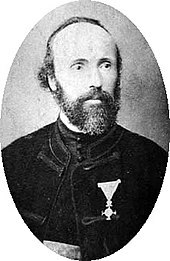 He emigrated in 1884 to the United States, where he would become a naturalized citizen. He worked for a short time at the Edison Machine Works in New York City before he struck out on his own. With the help of partners to finance and market his ideas, Tesla set up laboratories and companies in New York to develop a range of electrical and mechanical devices. His alternating current (AC) induction motor and related polyphase AC patents, licensed by Westinghouse Electric in 1888, earned him a considerable amount of money and became the cornerstone of the polyphase system which that company would eventually market. 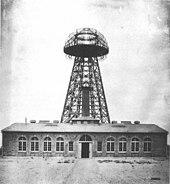 In 1884, Edison manager Charles Batchelor, who had been overseeing the Paris installation, was brought back to the United States to manage the Edison Machine Works, a manufacturing division situated in New York City, and asked that Tesla be brought to the US as well. In June 1884, Tesla emigrated to the United States. 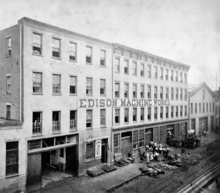 He began working almost immediately at the Machine Works on Manhattan's Lower East Side, an overcrowded shop with a workforce of several hundred machinists, laborers, managing staff, and 20 "field engineers" struggling with the task of building the large electric utility in that city. As in Paris, Tesla was working on troubleshooting installations and improving generators. Historian W. Bernard Carlson notes Tesla may have met company founder Thomas Edison only a couple of times. One of those times was noted in Tesla's autobiography where, after staying up all night repairing the damaged dynamos on the ocean liner SS Oregon, he ran into Batchelor and Edison, who made a quip about their "Parisian" being out all night. After Tesla told them he had been up all night fixing the Oregon Edison commented to Batchelor that "this is a damned good man." One of the projects given to Tesla was to develop an arc lamp-based street lighting system. Arc lighting was the most popular type of street lighting but it required high voltages and was incompatible with the Edison low-voltage incandescent system, causing the company to lose contracts in cities that wanted street lighting as well. Tesla's designs were never put into production, possibly because of technical improvements in incandescent street lighting or because of an installation deal that Edison cut with an arc lighting company. Two years after signing the Tesla contract, Westinghouse Electric was in trouble. The near collapse of Barings Bank in London triggered the financial panic of 1890, causing investors to call in their loans to W.E. The sudden cash shortage forced the company to refinance its debts. The new lenders demanded that Westinghouse cut back on what looked like excessive spending on acquisition of other companies, research, and patents, including the per motor royalty in the Tesla contract. 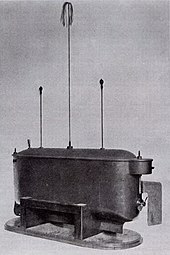 At that point, the Tesla induction motor had been unsuccessful and was stuck in development. Westinghouse was paying a $15,000-a-year guaranteed royalty even though operating examples of the motor were rare and polyphase power systems needed to run it were even rarer. 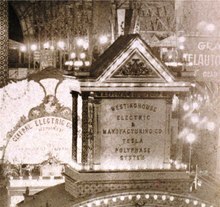 In early 1891, George Westinghouse explained his financial difficulties to Tesla in stark terms, saying that, if he did not meet the demands of his lenders, he would no longer be in control of Westinghouse Electric and Tesla would have to "deal with the bankers" to try to collect future royalties. The advantages of having Westinghouse continue to champion the motor probably seemed obvious to Tesla and he agreed to release the company from the royalty payment clause in the contract. Six years later Westinghouse would purchase Tesla's patent for a lump sum payment of $216,000 as part of a patent-sharing agreement signed with General Electric (a company created from the 1892 merger of Edison and Thomson-Houston). 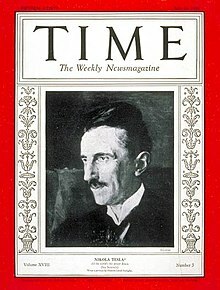 Tesla was a good friend of Francis Marion Crawford, Robert Underwood Johnson, Stanford White, Fritz Lowenstein, George Scherff, and Kenneth Swezey. In middle age, Tesla became a close friend of Mark Twain; they spent a lot of time together in his lab and elsewhere. 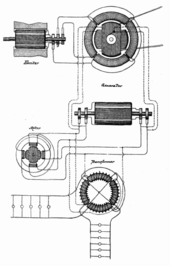 Twain notably described Tesla's induction motor invention as "the most valuable patent since the telephone." At a party thrown by actress Sarah Bernhardt in 1896 Tesla met Indian Hindu monk Vivekananda and the two talked about how the inventor's ideas on energy seemed to match up with Vedantic cosmology. In the late 1920s, Tesla befriended George Sylvester Viereck, a poet, writer, mystic, and later, a Nazi propagandist. Tesla occasionally attended dinner parties held by Viereck and his wife. 1 2 3 4 5 6 7 8 9 10 11 12 13 14 15 16 17 18 19 20 21 22 23 "Nikola Tesla Timeline from Tesla Universe". Tesla Universe. Retrieved 16 January 2017. 1 2 3 4 "Edison & Tesla – The Edison Papers". edison.rutgers.edu. ↑ Jonnes 2004, pp. 109–110. ↑ Carlson 2013, pp. 167–173. ↑ South, Nanette (23 July 2011). 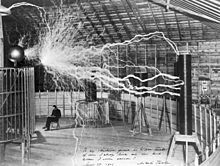 "Nikola Tesla – Radiography Experiments – Clips from "The Constitution, Atlanta, Georgia, p. 9. 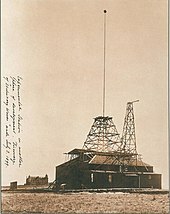 Friday, 13 March 1896"". Anengineersaspect.blogspot.com. Retrieved 10 September 2012. ↑ "PBS: Tesla – Master of Lightning: Colorado Springs". www.pbs.org. 1 2 [unreliable source?] Seifer, Marc. 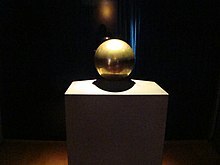 "Nikola Tesla: The Lost Wizard". ExtraOrdinary Technology (Volume 4, Issue 1; Jan/Feb/March 2006). Retrieved 14 July 2012. ↑ "ExtraOrdinary Technology – Vol 4 No 1 – Nikola Tesla: The Lost Wizard". teslatech.info. ↑ Carlson 2013, pp. 373–375. ↑ "[Projekat Rastko] John J. O'Neill: Prodigal Genius – The Life of Nikola Tesla (1944)". www.rastko.rs. ↑ "IEEE Edison Medal Recipient List" (PDF). Institute of Electrical and Electronics Engineers (IEEE). Retrieved 24 January 2015. ↑ Kent, David J. (2012-07-10). "Happy Birthday, Nikola Tesla – A Scientific Rock Star is Born". Science Traveler. Retrieved 2019-01-26. ↑ Kak, S. (2017) Tesla, wireless energy transmission and Vivekananda. Current Science, vol. 113, 2207-2210. ↑ "Tesla Memorial Society of New York Homepage". Teslasociety.com. Retrieved 2 November 2016. ↑ "Ilham Aliyev and President of the Republic of Serbia Tomislav Nikolic attended a ceremony to unveil a monument to outstanding Serbian scientist Nikola Tesla". 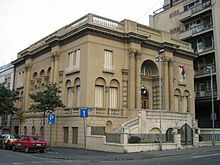 Official web-site of President of Azerbaijan Republicen – president.az. ↑ Amy Langfield (18 October 2014). "Tesla: An underdog inventor finally gets his due with museum". Cnbc.com. Retrieved 2 November 2016.